Adenosine deaminase (ADA) deficiency is an autosomal recessive disorder of purine metabolism that typically presents as a severe combined immunodeficiency in infancy (OMIM: 102700). Approximately 10–15% of patients have a delayed clinical onset (6–24 months) and a smaller proportion present later still (4 years to adulthood) with a milder phenotype and gradual immunological deterioration . 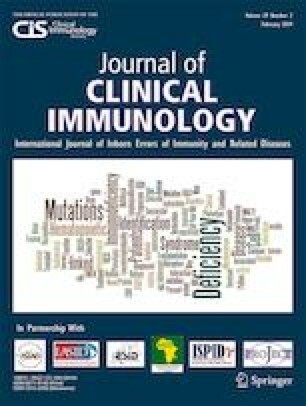 Despite the expanding application of modern genetic techniques, the diagnosis of primary immunodeficiencies (PIDs) can be difficult due to the ever-increasing phenotypic heterogeneity of these disorders . Here, we report a case of late-onset ADA deficiency caused by two novel mutations. Both the clinical and genetic diagnoses were challenging and only achieved following the application of several molecular approaches. This case also illustrates the increasing importance of collaborative working between clinicians and laboratory diagnostic scientists. The online version of this article ( https://doi.org/10.1007/s10875-019-00625-4) contains supplementary material, which is available to authorized users. This work is supported by the National Institute for Health Research (NIHR) Leeds Biomedical Research Centre and a Medical Research Council grant awarded to Professor Bonthron (MR/M009084/1). Department of Health and Social Care. Matt Hancock announces ambition to map 5 million genomes. https://www.gov.uk/government/news/matt-hancock-announces-ambition-to-map-5-million-genomes. Last accessed: 29th October 2018. Ellingford JM, Beaman G, Webb K, O’Callaghan C, Hirst RA, on behalf of the 100,000 Genomes Project, Black GCM, Newman WG. Whole genome sequencing enables definitive diagnosis of Cystic Fibrosis and Primary Ciliary Dyskinesia. bioRxiv 2018;438838. https://doi.org/10.1101/438838.